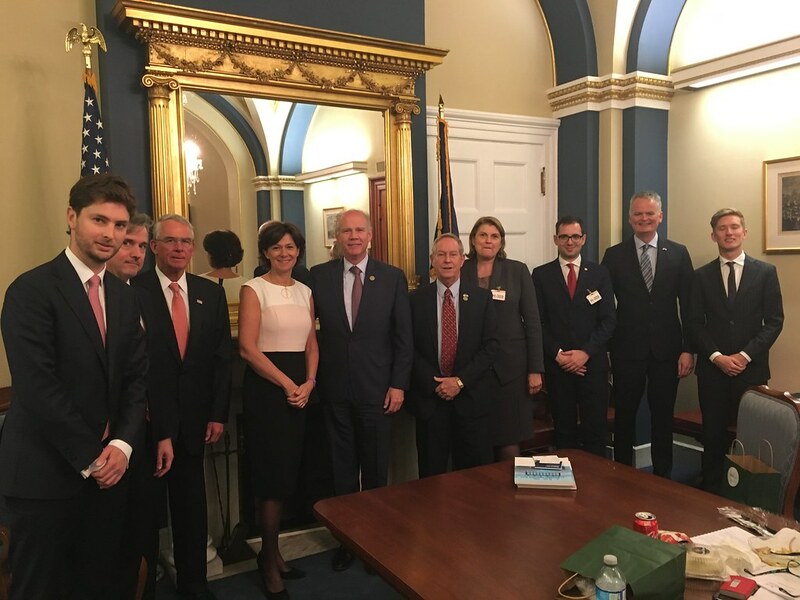 AmCham EU and five European AmChams (France, Ireland, Italy, Sweden and Romania) travelled to Washington, DC, last week to engage with a range of US policy-makers. The delegation delivered strong messages about the importance of the EU-US partnership to prosperity and security on both sides of the Atlantic. In a difficult environment for global trade, they also reiterated the importance of the EU and US working together to tackle common challenges. The transatlantic economy supports 15 million jobs in Europe and the United States. The delegation met with the US administration, including the White House National Security Council, US Department of Commerce, US Department of State and US Trade Representative. The visit also featured outreach to Capitol Hill, including a lunch hosted by Congressman Joe Wilson (R-NY), co-Chair of the EU Caucus, with Congressmen Dan Donovan (R-NY) and Francis Rooney (R-FL) and a meeting with senior members of Senator Orrin Hatch’s team (R-UT), Chair, Senate Committee on Finance. The delegation met with H.E. David O’Sullivan, EU Ambassador to the US. The visit also included a lunch with a group of EU and Member State Trade Counselors for an exchange of views on trade policy. In addition, the group participated in a press roundtable on EU-US relations with Jon Decker, White House Correspondent, Fox News Radio, and Shawn Donnan, World Trade Editor, Financial Times. While in Washington, Susan Danger, CEO, AmCham EU, was the guest speaker at a roundtable organised by the Global Women’s Innovation Network (GlobalWIN) with Hill staffers and company representatives. Ms Danger also spoke at the Organization for International Investment’s Spring Reception on Capitol Hill. For more information on our work in the transatlantic space and the latest numbers of EU-US jobs, trade and investment, visit our transatlantic page.